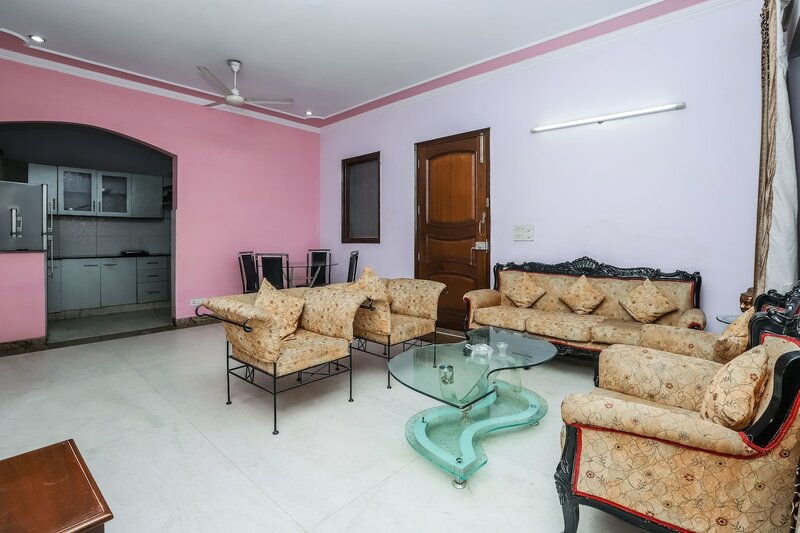 OYO Home 19733 Cozy 2BHK in located in the heart of South Delhi, very close to Okhla Metro Station. Tughlakabad Fort, Humayun's Tomb and Sikandar Lodi Tomb are located few miles away. A lavish and beautiful living room gives you a homey feel with its comfortable couches and small dining table followed by a bright and cosy bedroom. The rooms are well maintained and have wooden decor all over the room. What makes the property unique is the fact that it welcomes your pets too. So, if you are travelling with kids, this might be the perfect stay option for you. The house offers TV in the drawing room, air conditioner, geyser, mini fridge and power backup. There is also free parking for the guests. The home is just a few minutes drive from Hazrat Nizamuddin Railway Station and has a lot to do nearby.